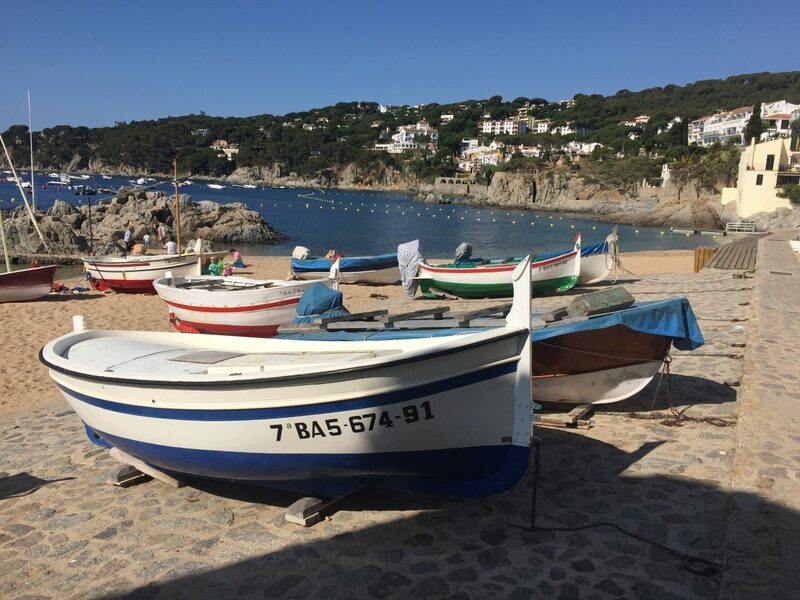 Fishing boats on the Costa Brava – Calella de Palafrugell, to be exact. A small seaside village nestling into the beautiful stretch of coastline just over the Spanish border. A great place for a painting holiday. 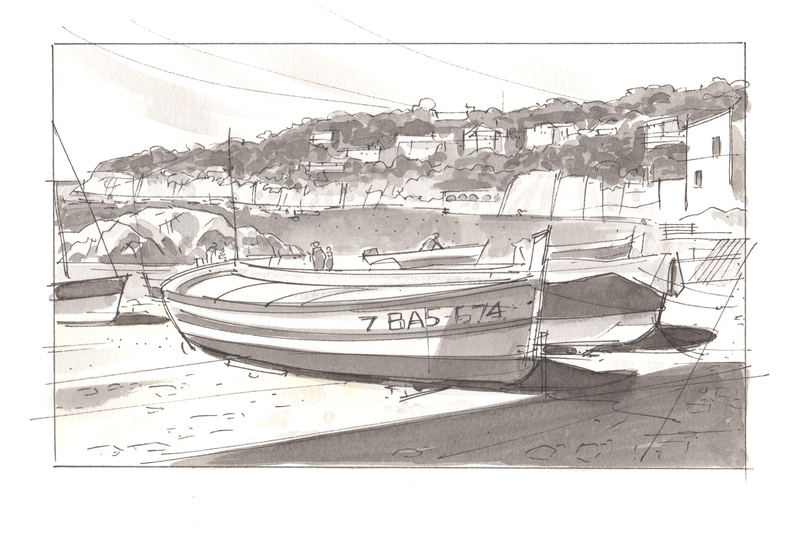 In this tutorial I’ve rendered the scene in various techniques starting with a very loose pencil sketch which picks out key elements of the scene – but not all. 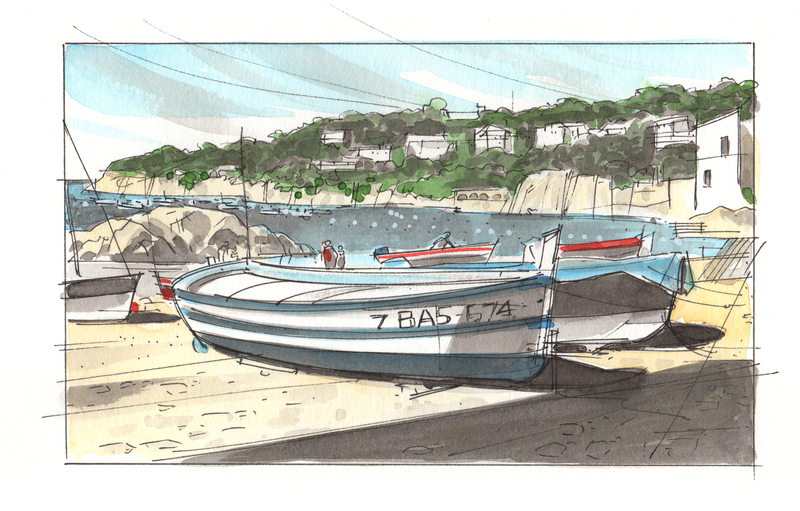 ‘Boats are difficult to draw’ I hear all the time. 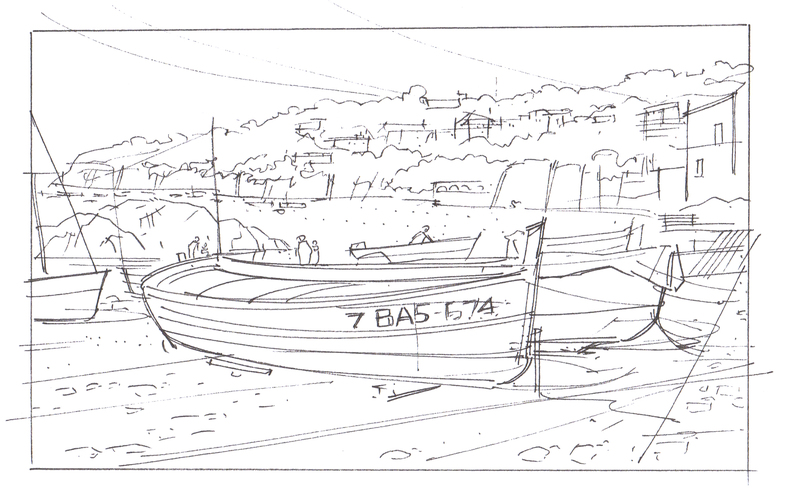 Tricky, yes, but try a page of roughs first and that will help. 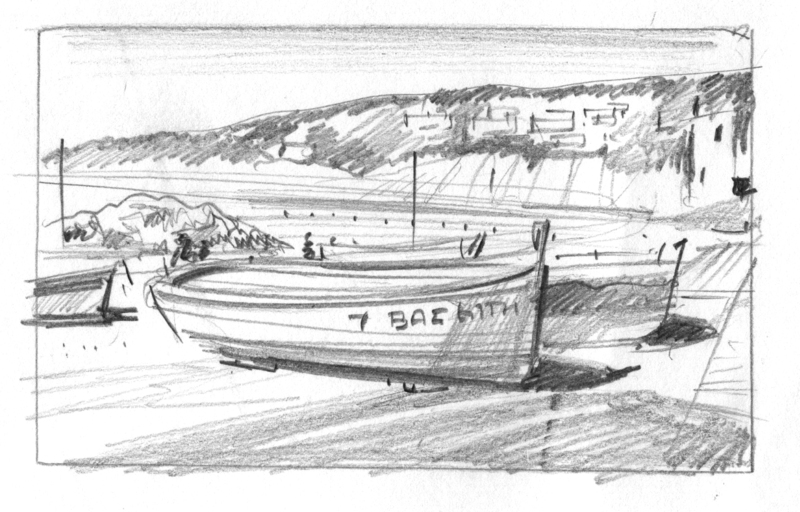 Here’s the initial rough just to set up the composition. Further below I’ve done a version in fine felt pen, then with added grey tones and finally some light washes over the tonal painting. 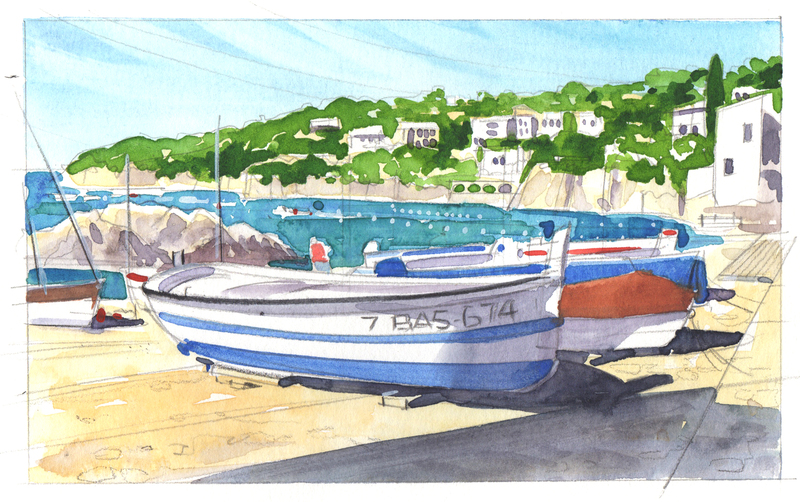 Beneath these there’s a more traditional version of the scene done purely with watercolour paints. Once I was happy with the overall layout, I redrew the scene in pencil in a larger size onto relatively smooth watercolour paper. I drew over the scene with a fine waterproof felt pen the erased the pencil sketch. Try to keep the line work sketchy. Think architectural illustration. At this point I washed layers of Payne’s grey watercolour over the scene in varying strengths to add depth. Lighter tones in the distance and stronger tones in the foreground. Keeping the washes light, I then added some colour finishing with a few splashes of Cadmium red. 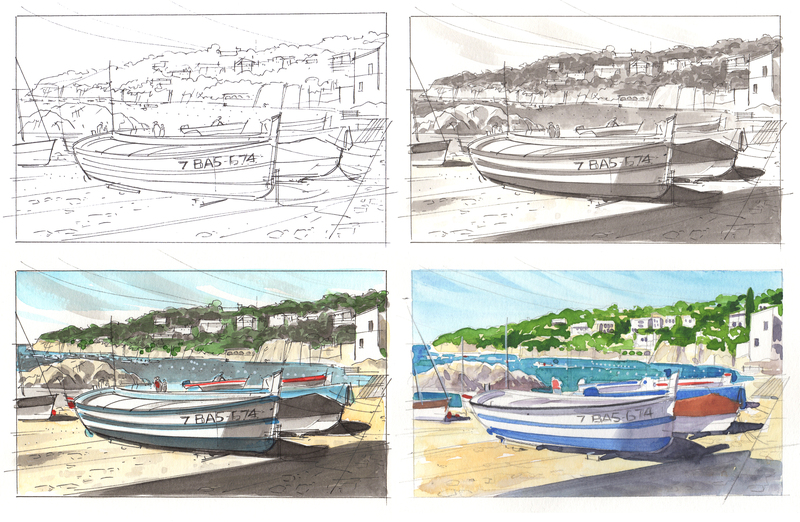 And here’s the watercolour version over an initial pencil sketch. For me the vital part of the scene is that cast shadow in the foreground. It is worth getting down to the shore early to catch this! Now for a cafe con leche…. And here’s all 4 images to compare..